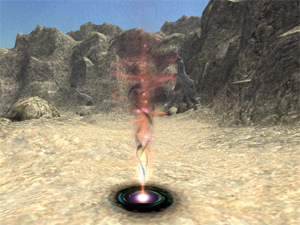 Voidwatch is a confrontation-style battle system which takes place in various fields and dungeons across Vana'diel of the past and present. As of 04/20/2018, here on HomepointXI server, Voidwatch Key Items (KIs) no longer delete upon completion of killing all Voidwatch NMs of a tier. A public command has been put into place to replace the missing Voidwatch keyitems depending on what you're currently holding. Just type !voidwatch and you will receive the missing keyitems. Voidstones can now also be acquired retroactively. If you miss a day and it’s been 40 hours since you last received a voidstone, you will receive 2 voidstones when interacting with a Voidwatch Officer NPC. Hopefully all this will make things a little more fun! Be level 75 or higher. In order to initiate a Voidwatch battle, the appropriate stratum abyssite on the initiating player must be advanced at least as high as the tier associated with the battle (see the tables below under "Voidwatch Ops"). Only the one player initiating the battle needs to fulfill this requirement. Higher tier stratum abyssites are obtained either by upgraded automatically, or by completing certain Voidwatch Quests. Planar rifts are gateways from an alternate reality through which Voidwatch monsters are manifest. Players must initially speak to a Voidwatch Officer in order to obtain a Stratum Abyssite key item. Each key item needs to be acquired only once. White stratum abyssite is acquired through the quest Drafted by the Duchy which can only be started after completing each of the three city paths. The Voidwatch Officer NPC will also provide the player with voidstones on request. Voidstones regenerate over time, one per 20 hours. This process is not automatic, so you need to talk to an Officer each time. You can hold an infinite amount of Voidstones, and your current amount can be found in [Status] → [Currencies] in your menu. Once you are at the proper zone, you can begin the battle by examining the specified Planar Rift. Please see the chart below for Planar rift locations. While Voidwatch Ops may be initiated at any of the three Planar Rifts, the VWNM will only spawn at one of them!! Check the below Voidwatch Ops tables for the location that the VWNM will spawn at!!! After defeating all of the monsters within a tier your stratum abyssite will automatically advance to the next tier. For example, a player who possesses Crimson Stratum Abyssite and then is present for the defeat of both Sarimanok and Cottus will automatically upgrade to Crimson Stratum Abyssite II, then to Crimson Stratum Abyssite III upon defeating Krabimanjaro, and finally Crimson Stratum Abyssite IV upon defeating Belphoebe and Kholomodumo. Your White Stratum Abyssite I will automatically upgrade into White Stratum Abyssite II upon sucessful completion of all Tier I Voidwatch battles. After completing Jeuno Tier III talk to any Voidwatch Officer in the present and proceed to Ru'Lude Gardens and talk to the Audience Chamber door. Next go to the Verdical Conflux in Pashhow Marshlands [S] for a cutscene. Talk to any Voidwatch Officer in the present and again go to Ru'Lude Gardens and talk to the Audience Chamber door. You will receive the White Stratum Abyssite IV & Tricolor Voidwatchers Emblem. After defeating all Jeuno Tier IV Voidwatch battles your White Stratum Abyssite IV will automatically upgrade into White Stratum Abyssite V.
After defeating all Jeuno Tier V Voidwatch battles your White Stratum Abyssite V will automatically upgrade into White Stratum Abyssite VI. Return to Hildegard to complete the Elshimo path. Return to Gushing Spring to complete the Kuzotz path. Complete both the Kuzotz and the Elshimo paths and return to Kieran in Norg to complete Zilart Tier I. Next talk to Gilgamesh for a cutscene who will tell you to talk to Kieran again. Kieran will upgrade your Ashen Stratum Abyssite into Ashen Stratum Abyssite II. Return to to Kieran to have your Ashen Stratum Abyssite II upgraded to Ashen Stratum Abyssite III. After defeating all 3, return to Norg and speak to Kieran to complete the Zilart Path. Return to Owain to have your Hyacinth Stratum Abyssite upgraded to Hyacinth Stratum Abyssite II. Kill Bismarck and return to Owain to complete the Tavnazian Path. Return to Camille to have your Amber Stratum Abyssite upgraded to Amber Stratum Abyssite II. This page was last edited on 8 November 2018, at 05:42.